petition: Justice for Tommie, a dog set on fire!! 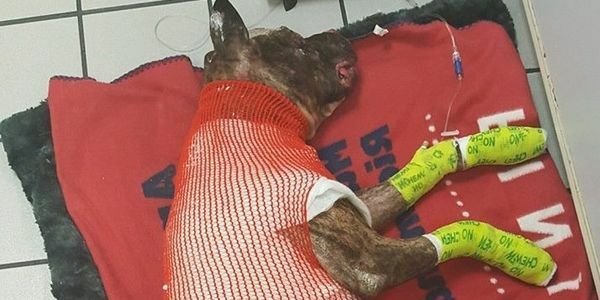 Justice for Tommie, a dog set on fire!! On February 10, 2019 in Richmond, Virginia, a dog was tied to a pole in Abner Clay Park, doused with an accelerant and set on fire. Only the quick action of the Richmond Fire Department saved his life, and now Tommie faces a long recovery at the Richmond Animal Care and Control (RACC) Shelter with burns to over 40% of his body. An adult male wearing multiple layers of clothing was seen running from the scene. Anyone with ANY information on this sickening crime against a helpless animal is urged to contact Richmond Crime Stoppers at 804-788-1000. This monster must be held responsible for his actions. We demand justice for Tommie!! Sign and speak out for animals like Tommie who can't speak for themselves! Sign the petition to demand that the person who committed this cruel and unspeakable act of animal cruelty is caught and held accountable! A T-Shirt has been created to spread the word about Tommie and to raise money for all abused animals. 62,000 dollars have already been raised from supporters all over the world. If anyone would like to help in this cause please go https://www.bonfire.com/team-tommie/ and purchase a shirt for Tommie. Spread the word! UPDATE- the reward for information leading to the person responsible for the act of unimaginable cruelty that resulted in Tommie's death is now 25, 000 dollars. Someone, somewhere knows something. Lets keep getting the word out! It is with a heavy heart that I update everyone with the sad news that Tommie succumbed to his wounds on feb 15. This sweet dog was the victim of a vile and cruel act and even though he is gone may everyone who has heard his story continue to advocate for innocent animals and stop outrages like this from happening. RIP Tommie. AN UPDATE- Tommies's condition is grave and vets say despite all they can do this innocent dog may not survive his ordeal. There is a 10,000 dollar reward for ANY information that leads to the apprehension of the person who committed this unspeakable crime. Please get the word out there!